1917 was not a good year for the Allies in military terms. The French had lost one million dead by 1917 and the failure of the Allied offensive in the Spring resulted in mutiny in the French army; soldiers continued to man the trenches, but refused orders to attack. The major British offensive at Ypres ground to a halt in the mud around Passchendaele and, despite early success, the battle of Cambrai resulted in failure. There was also disaster on the Italian front, where the Italians suffered a major defeat in The Battle of Caporetto. However, in 1917 important events were taking place away from the battlefields. In April the USA joined the war against Germany, primarily as a result of German U Boats sinking US ships. In November the Bolsheviks seized power and took Russia out of the war, leaving Germany to fight on just one front. Although the absence of Russia from the war was a boost to Germany, the long term prospects for Germany were bleak. The USA was planning to create an army of three million men while Germany’s ally, Austria-Hungary, was becoming significantly weaker, with talk in Germany of being “shackled to a corpse”. The year also saw significant events inside Germany where amid shortages, industrial unrest and calls for a compromise peace, the army took control. US troops would not begin to arrive in strength until the Summer of 1918, but by the end of 1917 Germany had large numbers of troops released from the war against Russia and superiority in numbers in France and Belgium. At a conference, held ironically on 11 November 1917, the German high command decided to use this window of opportunity to launch a series of offensives against the British and French. This was a major gamble. A series of offensives was planned during the Spring of 1918, the first of which ( codenamed Michael ) was to be launched against the British 5th and 3rd Armies across the River Somme. The opening of these attacks saw the end of deadlock on the Western Front and the return to open warfare, last seen in 1914. 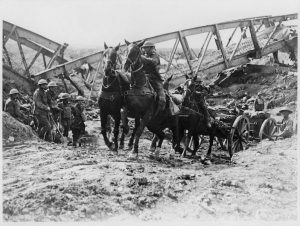 The scale of the first German attack launched on 21 March 1918 was colossal; 74 divisions were available to launch an assault across a 50 mile front. Over 6,000 guns and 4,000 heavy mortars fired more than a million shells in the opening five hour bombardment. Using tactics developed in late 1917, groups of storm troopers moved forward seeking weaknesses in the British lines and driving into allied held territory. Artillery and mass infantry attacks then dealt with defenders left behind. The British were aware that an attack was imminent and desperate attempts were made to create a system of defence in depth. This consisted of a forward zone, designed to be lightly held via a series of strong points, and a battle zone where it was hoped that the German offensive would be halted. However, events conspired against British preparations. The section of line attacked had recently been taken over from the French and was in a poor state of readiness. The British Army in France was recovering from a major reorganisation and was significantly under strength as the Prime Minister, Lloyd George, mistrusting the British commander Douglas Haig, held troops back in Britain. The weather also placed British defenders at a disadvantage, when on the morning of 21 March thick mist cloaked the assaulting Germans. The initial attack met with considerable success and the British defences were overwhelmed in many places. Supported by the French, they carried out a fighting withdrawal, eventually holding the Germans in front of Amiens, over 30 miles from their front line on 21 March. The Germans were brought to a halt on 5 April. The Allies lost 1,200 square miles of ground and lost 270,000 men, many of them prisoners. However, the German Army had lost 240,000. The offensive was essentially a failure, in that it failed to achieve any of its objectives, of rolling up the British lines, splitting the British and French armies or capturing Amiens. The Allied line held and, moreover, no key strategic positions were lost. One consequence of the German offensive was that the Allies recognised the need for an overall commander to coordinate their strategy and the French General, Ferdinand Foch, was appointed on 26 March. A second offensive was again launched against the British 2nd Army across the River Lys on 9 April, codenamed Georgette. The result was similar to that of 21 March. The British were driven back and the Germans gained considerable ground, but a combination of stubborn defence and French assistance held the German attacks. Although none of strategic objectives, of taking the railway terminus of Hazebrouck or taking Channel ports, were achieved, the offensive caused great alarm to the British: on 11 April Haig issued his famous “With our backs to the wall” order of the day. However, German losses were considerable and the offensive was called off on 29 April. After a lull, the German offensives continued on 27 May with a massive onslaught against the French in the Champagne region, codenamed Blücher, which drove towards Paris. Also caught up in the attack was the British IX Corps, which had already been through the first two Spring offensives and sent South to a supposedly quiet sector. Early German successes caused great concern amongst the Allies, with the French government making preparations to leave Paris. US Divisions were now arriving in France and these were used to release French troops from quiet sectors in order to stem the German tide. Another factor helping the Allies was the Spanish flu, which had a disproportionate effect of the German Army. By 14 June Blücher had ground to a halt. Two further German offensives were launched against the French on 9 June, codenamed Gneisenau, and on either side of Rheims on 15 July. These attacks made little progress; it was clear that the Germans were weakening, while Foch was able to move French, British and US divisions to meet any threat. By July it was becoming evident that the tide of war had turned. On 4 July the Australians carried out a successful operation, with some American support, to capture the important village of Hamel. On 18 July the French and Americans launched a major counter-offensive, which the British also joined. This became known as The Second Battle of the Marne and was a major victory, taking 29,000 German prisoners. The Allies now began a series of offensives which would drive the German Army back across France and Belgium and ultimately result in Germany suing for peace in a period known as The Hundred Days to British historians: the French and Americans have some issue with this term and point out that the first Allied counter-attack was 21 days earlier on the Marne. It was clear now that a German defeat was inevitable. The German Army was unable to replace its losses, while US troops were arriving at a rate of over 200,000 a month. However, German troops fought back stubbornly and there were still formidable German defensive systems, in particular The Hindenburg Line. Foch’s strategy was to strike a series of offensives against the Germans in quick succession; as the Germans were attempting to meet one offensive, they would be immediately struck by another. On 12 September, the American First Army launched an attack against the St Mihiel Salient in what was the first and only solely American offensive of the war. Two tank battalions, commanded by Colonel George Patton, played a major part in the attack. A series of major offensives began on 26 September, when two French and two American armies launched the Meuse-Argonne offensive. Over 1 million American troops took part in the battle, though the inexperience of many units resulted in slow progress and high casualties. On 27 September the British First and Fourth Armies opened a broad offensive against the Hindenburg Line. Attacking in the dark and, taking the Germans completely by surprise, the Canadians crossed the Canal du Nord, going on to capture the key position of Bourlon Wood and to liberate Cambrai. On 29 September, a major assault, involving British, Australian, American and French troops, took place where the Hindenburg Line incorporated the St Quentin Canal. In one of the most spectacular feats of the war, the Midland 46th Division crossed the canal, completely breaking through the Hindenburg defence line. On 28 September the British Second Army and Belgian Army began an offensive in Flanders. This met with great success and more ground was taken at Ypres in a few days than in months of fighting during 1917. Although the Allied advance was held up by German defensive actions at natural barriers, such as the River Selle, the Germans were now in full retreat. On 4 October, the German government telegraphed President Wilson and requested peace terms, hoping to get better terms from the USA. It was clear that the German Army was defeated and could no longer offer effective resistance and the situation in Germany had come to a crisis point with mutiny in the navy and the spread of revolution. 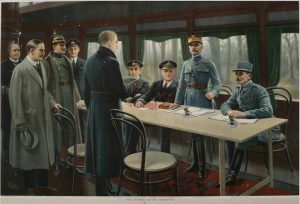 The process of agreeing the Armistice was held up by the Allied insistence that the Kaiser resign, which he did on 9 November. There was no negotiation; the Germans were given 72 hours to agree to terms or the war would continue. The Germans were shocked by the harshness of the terms and the military played no part, sending civilian ministers to sign in order to avoid any dishonour falling on the army. The Armistice was signed at 5.00am on 11 November and came into effect at 11.00am. It was not a peace treaty, but a ceasefire which had to be renewed each month until a peace treaty was signed. There has been considerable debate surrounding the Armistice during subsequent years. Although the terms were seen as harsh at the time, the German Army had not been driven back over German frontiers. This fed the “stab in the back” theory that the army had not been defeated in 1918, that it had been betrayed by socialists, communists and others at home. This theory became a major part of Nazi propaganda. The Allies did not offer any terms for the end of hostilities in Europe in 1945, but demanded an unconditional surrender.